I’m so excited to finally share my Madeira photos on the blog! This trip was absolutely incredible, and I can’t wait to go back :) For a little background – my husband is Portuguese, and Madeira is the island that his mom is from. We went on this trip with Neal’s mom and brother, and it was so fun to meet their extended family and to hear stories about his mom growing up on the island. This was my first time visiting and I honestly didn’t know what to expect. I did some Googling, and found out that Madeira is about 300 square miles - actually smaller than Prince William County, VA! I seriously questioned whether we’d see all there was to see in just a couple days, but boy was I wrong! While the actual area of the island may not seem that big, the mountains and steep, zigzagging roads make it seem much larger :) We were there for 8 days and I don’t feel like we even scratched the surface of all the things to do! I’ve got a bucket list for next time haha. One of my favorite things about Madeira is that everything has an ocean view! Thanks to the crazy steepness of everything, it’s hard to find a place where you can’t see the ocean. We stayed in the city of Funchal, and our hotel was in walking distance of so many amazing restaurants and shops. We spent our first afternoon just wandering around downtown and had lunch at one of the little cafés. This is pretty much what I drank the whole week – passion fruit-flavored soda. Neal was super excited about it because Brisa is only sold in Madeira and we can’t get it in the U.S.! We were so lucky to have Neal’s family to show us around and play tour guide for a few days. His cousin Renato took us on our first big adventure to Cabo Girão – a giant sea cliff with a skywalk! You can’t see anything behind us because we were up in the clouds haha, but the view looking down was gorgeous. Up there is Cabo Girão, where we just did the skywalk! We ate so much seafood on this trip, and sometimes picked out the exact fish we wanted :) I ate a ton of espada, or black scabbardfish, including one time with fried bananas on it. Which sounds like a pretty weird combination, but was actually delicious! I also loved the milho frito, or fried cubes of corn haha. So yummy! Next up on our adventure was Curral das Freiras, or Valley of the Nuns – this secluded village was once a refuge for nuns fleeing from pirates back in the 1500s! I guess this would be the one place where every house does not have an ocean view - 360 degrees of mountain will do that haha. Then we went to Pico do Arieiro, one of the highest mountain peaks in Madeira. I would love to shoot a wedding up here! The views were incredible. Apparently we lucked out weather-wise because it’s normally very windy up there. We saw a couple runners training for the next day’s Madeira Island Ultra-Trail – these crazy people were competing in a 115km (71 miles) race across the entire island through the mountains! The race started at midnight and they all ran with headlamps. I can’t even. That is crazy haha. So we went from the top of the mountains which was basically desert, to a freakin rain forest! We went hiking in Ribeiro Frio (translation: cold river) and it was seriously one of my favorite parts of the trip. Renato is a plant guru so he was teaching us about everything we saw! At the end of the hike, the trail brought us out to a little bar where we had our first poncha – the traditional alcoholic drink of Madeira. The bartender made it fresh, and it’s made with sugar cane liquor, honey, and fruit juice (we had lemon and orange juice). Delicious! Right next to our hotel was Mercado dos Lavradores, or the farmer’s market of Funchal. This was on my list of things to see, so it was awesome that it was right next door! We went there a few different days and I loved sampling all the fruits – my favorites were the pineapple-banana hybrid (the green ones) and the nespras (the little orange ones). And the fish market section was really cool too! I could take photos in this place all day. I loved getting to meet Neal’s extended family while we were in Madeira. They were all so nice and insisted on driving us around everywhere to show us the sights! (We only took public transportation once or twice!) They also fed us amazing home-cooked meals, and took us out to eat at their favorite local spots. I know tourists in Madeira have plenty of fun navigating the island on their own, but it really made our trip so much better to have amazing family around that really took care of us. Most of the conversation was in Portuguese, and I was so happy with how much I understood! I took Spanish in high school, and started studying Portuguese when Neal and I began dating – a lot of the words are spelled similarly, but pronunciation can be very different. I’m used to Neal’s American Portuguese accent and have an easy time understanding everything he says, but anyone without that American accent was a little more difficult for me to follow. But every day it got a little bit easier! 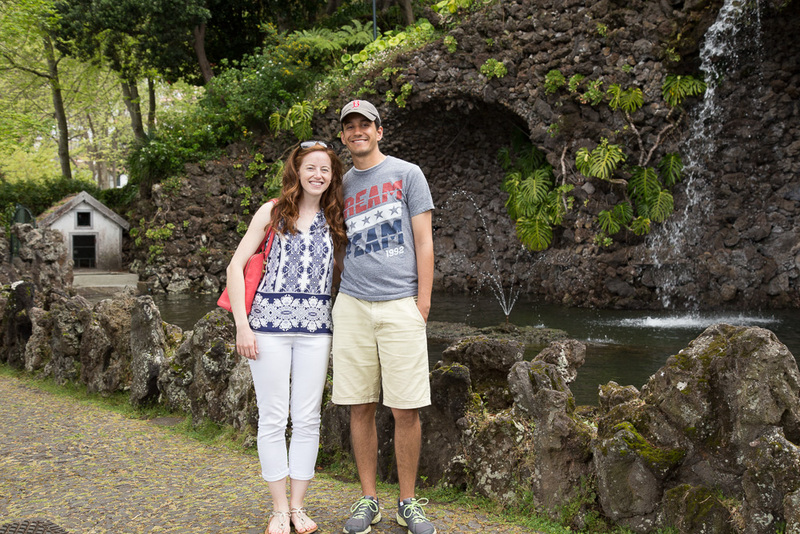 These next couple photos are from Santa Catarina Park in Funchal – also within a short walk from our hotel. I loved all the beautiful flowers and the view! That’s why I picked this park to shoot a couple’s session a few days later – I’ll be sharing those pictures soon! I don’t think I can properly explain how much walking we did on this trip, and it’s ALL hills haha. Wish I brought my Fitbit to get an accurate count! One of the most well-known attractions in Funchal is the cable car that goes from the center of the city up to Monte, where there’s a beautiful church and tons of gardens. Cristiano Ronaldo (the world’s greatest soccer player, unless you’re asking a Messi fan haha) is from Madeira! So obviously he has his own museum and we had to visit :) It was crazy to see all his trophies and awards! There’s also a new and infamous Ronaldo bust at the airport that we had to take photos by haha. Neal took this lovely photo of me after a rather unfortunate incident. That’s the public restroom behind me, which I had just used to wash bird poop out of my hair. He found it hilarious. Since they say birds pooping on you is good luck, we went to the casino later that night and I won 40 euros playing roulette. Given the choice, I would have rather had a poop-free head, but I’ll take the 40 bucks. One afternoon we took a visit to Cristo Rei – not quite as big as the Brazilian version, but still very impressive! And the views all around were incredible. Look at that road you guys! While Madeira’s highway system is very modern, so many of the roads are super steep and winding. I didn’t trust the guardrails to save us from going over a cliff haha, so I’m very thankful we had competent drivers all week! The beaches in Madeira are almost all rocky like this, but people do lay out on them! Doesn’t look like the most comfortable thing haha, but the water is gorgeous! I loved walking around the city at night and seeing all the lights from people’s homes going up the mountains. Porto Moniz is known for its natural swimming pools. Aren’t they beautiful?! Now who wants to plan a trip back there with me? !